As we have since July 2006, each Friday we’ll post our sampling of cigar news and other items of interest from the week. Below is our latest, which is the 563rd in the series. 1) Boveda, the Minnesota-based “global leader in two-way humidity control,” has introduced what it is calling “the best innovation for premium cigars since the invention of Boveda.” The new Boveda Smart Sensor will sync up your humidor’s humidity and temperature levels with an app on your phone or tablet. After a two-point calibration is completed, the device will be accurate within +/- 1.5% relative humidity, and the app can be customized to alert you to humidity or temperature changes exceeding a user-defined threshold of acceptability. 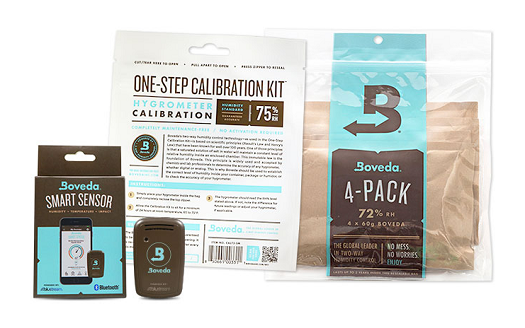 The Smart Sensor is currently available at Boveda.com and retails for about $40, or $50 if you also want four large humidification packets and a calibration kit. Check back at StogieGuys.com in the coming weeks as we are currently testing the device for a full product review. 2) One of the sticking points in the current last-minute budget negotiations in Washington is the extent to which any deal will include funding of the Children’s Health Insurance Program (CHIP). The program is funded largely by tobacco taxes, including a 40-cent-per-cigar tax on handmade cigars. Although the program’s “funding” would expire if a deal isn’t struck, the tax on tobacco remains whether or not a deal is struck and signed by the president. 4) From the Archives: Winter is tough on cigar humidity, but if you think your humidity may be off, the first thing to check is the accuracy of your hygrometer (especially if you are using the spring-loaded hygrometers that come in most humidors). For that, you’ll need to perform the simple but extremely useful salt calibration test. 5) Deal of the Week: StogieGuys.com recommends Bespoke Post, a monthly collection of awesome items (think fine bar accessories, hot sauce kits, wine, workout gear, exclusive cigar packages, and more) delivered for just $45. Once you are signed up, there is no obligation; you can skip or purchase each month. Sign up here to be eligible for the February box; the “Churchill” box features four cigars, an ashtray made of reclaimed wood, an odor-eating candle, cedar spills, and a cutter.